This is Thanksgiving weekend in Canada and many people will enjoy a special meal sometime over the next three days. Usually it is on Sunday or Monday. I’m travelling to visit my parents after I get off work tomorrow night and we’ll enjoy some sort of special meal on Monday. I can’t take much food with me but I thought tonight I could try the Cranberry Sauce recipe from the Game section in The New Galt Cook Book (1898) since I can take it with me tomorrow. No one claims it as their own recipe in the cook book. I bought a package of fresh cranberries at the store but the quantity was by weight 340 grams (12 ounces) rather than volume. My first step was measuring to be sure I had 1 quart (4 cups) of cranberries. I had slightly less but I went a head and followed the recipe. One quart of liquid is bigger than 1 quart of dry ingredients but with this amount the difference isn’t that significant. I put 1 quart (4 cups) of water in a saucepan and then weighed 1 pound of sugar. I added the sugar and turned up the heat. Once it was boiling I added 1 quart (4 cups) of washed cranberries. I left it to cook for 15 minutes but stirred occasionally to keep the berries turning in the liquid. They started popping quickly and it was at this point I realized this was not going to be my typical cranberry sauce. It was very liquid. I kept cooking for the full-time and then removed it from the heat. I let it cool a bit and then tasted. I’ve been curious for a long time about cranberries and I’ve never been sure if they were available in Ontario. I know that we have something called highbush cranberries but the type we use today are grown in bogs. 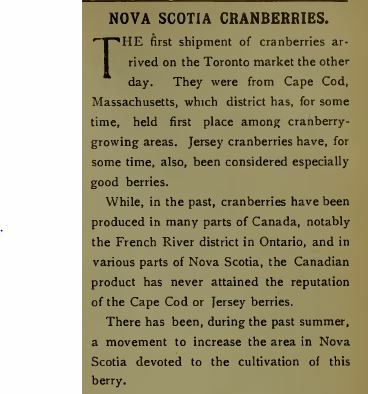 I explored some 1898 fall issues of The Canadian Grocer magazine and discovered that the most coveted cranberries came from Cape Cod in the United States but that they were also grown in several parts of Canada. I’ve inserted a digital clipping from this magazine which talks about attempts to increase cranberry production in the province of Nova Scotia. Bog cranberries are commercially grown in Ontario today … at least based on the number of websites I found. This one included some cranberry history. I can’t vouch for the complete accuracy of it but it appears valid and Canadian Gardening magazine has some information too. Some day I hope to go to the Cranberry Festival in Bala Ontario. A portion of an article about growing cranberries. It appeared in an 1898 issue of The Canadian Grocer. In looking at the recipe I assumed it was very much like the one I see on the cranberry package. The package says boil one cup of water and one cup of sugar and then add the package of cranberries. Cook for 10 minutes. The ingredients are the same but the proportion is very different. The 1898 cranberry sauce is … a SAUCE!! It is very liquid rather than the berry filled sauce I’m accustomed to making and nothing at all like the canned jam like cranberry sauce my family had when I was growing up. I like this as it can be poured over the meat. If you don’t like the texture of cranberry sauce but like the flavour than this might be a good option since it would be easy to strain out the berries. I was afraid it was going to be too sweet but it is nice and tart. I’m looking forward to trying this sauce with some turkey on Monday. One quart of cranberries, one quart of water and one pound of white sugar; make a syrup of the water and sugar. After washing the berries clean and picking out all poor ones, drop them into the boiling syrup; let them cook from fifteen to twenty minutes. They are very nice strained. Serve with turkey. I still have lots of chicken left from yesterday’s recipe so I’m going to serve some with a sauce. I’m taking a risk since the recipe for Mushroom Sauce for Chicken comes from the same contributor — Mrs. A. Taylor – as yesterday’s disappointing recipe from The New Galt Cook Book (1898). I’m using mushrooms I bought at a grocery store that were grown in a greenhouse in Essex County Ontario. I measured the mushrooms to see if I had 1 pint (2 cups). I had just 1 cup so I’m making half the recipe. I got some salt and tried an unfamiliar (at least to me) technique for removing the skin of mushrooms. I wasn’t very successful at creating naked mushrooms but decided to go ahead. I put them in a pot along with half a blade of mace and some nutmeg. This is an interesting combination of spices since mace is the outer coating of nutmeg. Next I weighed butter and found that 3/4 of an ounce is about 1/2 a tablespoon. I rolled the butter in 1/2 teaspoon of flour and added it to the other ingredients. I turned the heat low and added 1/2 pint (1 cup) of cream. Then I turned the heat up until it was boiling. I followed Mrs. Taylor’s instruction to stir continuously. The mushrooms gradually shrunk in size and coloured the cream. I tasted and decided to add a little salt. I’m assuming that if I was more successful at skinning the mushrooms using salt, they would have a bit of a salt on them when they went into the sauce. Once the sauce was boiling and had thickened a bit I removed it from the heat and poured some over my serving of chicken. Mrs. A. Taylor is Margaret Fisher. Her husband Alfred was born in Scotland in 1846 and came with his parents when he was about seven. According to the 1871 census his family were working in a variety of occupations including as tailors, a carriage trimmer and a store clerk. After the couple were married Alfred is always listed as a merchant. He had a dry goods store called Woods & Taylor in Galt. At restaurants I sometimes order pasta or chicken in a creamy sauce so this tasted somewhat familiar. The nutmeg and mace are a bit of a surprise flavour but they go well with chicken and mushrooms. I did miss the herbs that sometimes go with this sort of sauce in modern times. The recipe appears in the game section so it would likely work well with wild birds and wild mushrooms if you are confident about your ability to identify safe fungi. The preparation technique for this recipe is simple so I might try it again. The quantity probably suits the Taylor family. There’s enough to either drizzle over or drench your chicken. Rub off the tender skin from a pint of mushrooms with a little salt; put them in a stew-pan with a blade of mace, a little grated nutmeg, an ounce and a half of butter rolled in a teaspoonful of flour and a pint of cream; put on the fire and boil till thick, stirring all the time. I know that making a rabbit recipe on Easter Sunday might seem a bit macabre but I wanted to make it while I had some willing tasters around. It must be an Easter tradition for some people since there was lots of rabbit available at the Kitchener Market on Saturday. My family usually has ham for our Easter celebration and that’s what I prepared for lunch. However, the ham recipes in The New Galt Cook Book (1898) are for an old style ham that has to be boiled and I haven’t found one yet. Instead we enjoyed the modern convenience of a spiral cut ham for lunch and I prepared Mrs. James Young‘s recipe for Stewed Rabbit as our evening meal. This is my first recipe from the Game section of the cook book but my rabbit is farmed rather than wild. Many years ago while working at a historic site, I had to make rabbit stew for an event. We made a huge pot of it but someone else must have cut up the rabbits. I simply stirred and prepared other ingredients to go in the stew. This time I had to select a small dressed rabbit at the market and then prepare it for use in this recipe. It had a tag indicating it came from Abate rabbit packers in Arthur Ontario. I didn’t have to skin or clean it but mine did come with the edible organs attached. I removed those first and chose not to include them in the stew. My brother’s cat will have a feast tonight. I decided to approach cutting up the rabbit like a chicken although I don’t have much experience with chicken either. I put 1/4 pound (1/2 cup) of butter in a stewing pot and let it melt while I prepared the rabbit. Once it was in pieces I placed them in the pot and added 1 pint (2 cups) boiling water. I chopped three stalks of celery and added it to the pot. I covered and left it to simmer. I checked after 30 minutes and there was still enough liquid and the meat was beginning to become tender. I chose to let it cook another 30 minutes. At that point I grated about one-quarter of an onion and added the result to the pot. I also added salt, pepper and some curry powder. While the stew continued to simmer, I prepared the flour and milk. I put 1 heaping teaspoon of flour in a small bowl and added a bit of the 1/2 pint (1 cup) of milk I had ready. Once the flour and milk mixture was smooth I added it to the rest of the milk and then poured it all in the stew. I brought it to the boil and then served my stewed rabbit to one eager diner and two reluctant. I have a feeling we are going to know as much as possible about Mrs. James Young (Maggie McNaught). She contributed so many varied recipes for The Galt Cook Book as well as being very involved in the church producing the cook book. Margaret “Maggie” McNaught married James Young on February 11th 1858. 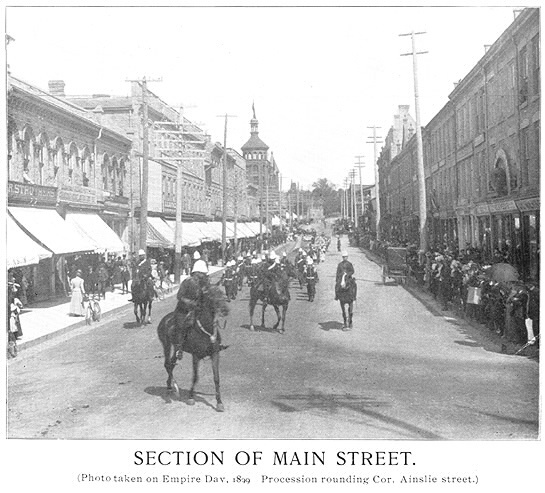 The following description of their wedding appeared in The Berlin Chronicle newspaper and was later transcribed and appears on this website: “In Brantford, at the residence of the bride’s father, on the 11th inst., by the Rev. John Dunbar, Glenmorris, James Young, Esq., of the Galt “Reformer,” to Miss Margaret McNaught, Brantford.” The couple prospered and had two children. James became very involved in politics and the Dictionary of Canadian Biography mentions his many achievements but also his recreations which included hunting. Mrs. Young’s rabbit could be a wild one shot or trapped by her husband or relative or perhaps purchased at the market. I imagine rabbits were also being raised as a sideline on some farms and then sold at market or in shops. My father was pleased that I was cooking rabbit but my mother was hesitant to even try the stew. It smelled good and looked like any white meat stew or soup. It tasted good! Basically it is like chicken. I realize that the flavour of a farmed rabbit is going to be much milder than that of a wild rabbit. Since the recipe appears in the Game section I suspect Mrs Young was using a wild rabbit. I don’t have access to the meat of a wild rabbit … at least not yet. I suspect the amount of butter in the recipe is intended to help tenderize the tougher meat of a wild rabbit. This is a great recipe to try if you have access to any rabbit wild or farmed or even use it with chicken. I liked the addition of curry and would add more next time although my father thought it didn’t need any more. My mother’s reaction moved from reluctant to eager after her first bite. 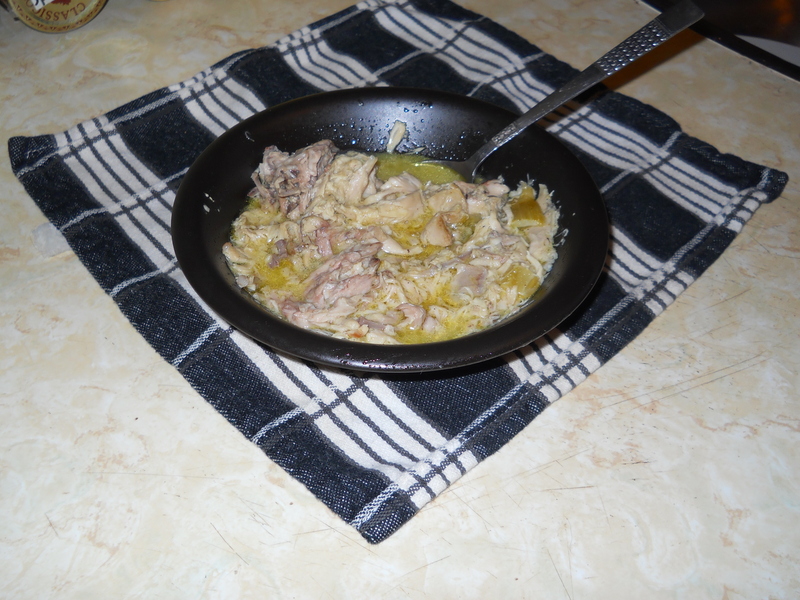 Mrs. James Young’s Stewed Rabbit recipe was a success. Update: April 21, 2014 — My brother took some home and has reported his opinion of this version of stewed rabbit. He thinks it would be better with wild rabbit. It would have more flavour. The photo is his since my camera is not working well. One rabbit, one-fourth pound of butter, a little flour, one pint boiling water, a little grated onion, salt, pepper and celery. Skin and clean the rabbit, cut into pieces, put the butter into a stew-pan with the pint of water, the pieces of rabbit and several pieces of celery cut up fine;when this is cooked tender take half pint of cream or milk, make a paste of the spoonful of flour with a little of the cold milk and add this to the stew (the onion grated should be put in half an hour before). Season, let it boil up well and serve hot. A little curry powder may be added.